Scott St. Clair: James Gandolfini, R.I.P. Yesterday we lost one of the great characters of all time when James Gandolfini, the actor who portrayed him, died of a massive heart attack while in Italy. What made Gandolfini’s Tony Soprano a work of art was both excellent writing — junk is still junk even when performed by a great actor — and his ability that only the best actors have of creating empathy for a character. That’s what Gandolfini did as well as anyone and better than most. Tony Soprano was a loathsome sociopath and hardened criminal of the worst sort. In real life, we would be demanding his arrest and imprisonment. But because we were allowed to see him up close and personal we cared about what happened to him. That doesn’t mean we cared for him — what sane person wants to hang around with a guy who bashes the face of someone on a wooden chair and then goes to a counseling session with his serially cheated upon wife only to find a tooth from his beating victim in the cuff of his slacks? Instead, he became a multi-dimensional, complex individual whose fate mattered to us. We saw Tony in good times and bad (mostly bad) making his way through the day never certain when the next vulnerability-shoe would drop. Whether it was his chronic panic attacks, his struggles with a mother who had borderline personality disorder and who projected her needy loathing of her dead husband upon him, or his struggles with his children, the only two people who could check and confound him at will. In one episode, Tony is in bed with his wife Carmella (he spent more time in the beds of other women, but that’s beside the point) and expressed to her their common frustration with their children Meadow and A.J. saying, in effect, that if they really knew how little power they, as parents, had over them then they’d really make life hell. This from a man who, earlier in the day, had killed people in the furtherance of a massive criminal enterprise that he headed that netted millions and controlled businesses, unions and politicians. “The Sopranos” is rare in that it is timeless — the first episode is as fresh today as it was when first broadcast over 15 years ago. In that respect, the series is like the first two movies in “The Godfather” series, it’s cinematic genre equivalent from the preceding generation. You can watch them over and over and over and always get a new insight or perspective not only on the characters, but also on life in general. And isn’t that the purpose of great art — to teach us about ourselves as well as about the artist? No more visits with Tony and his crew at Satriale’s pork store, the Bada Bing, the pizza place or Nuovo Vesuvio, the high-end Italian restaurant owned by his childhood best friend Artie Bucco, an alter-ego to Tony who had similar self-loathing and doubt while lacking his animal instincts and fierceness but at least had a legitimate business. Celebrities of minimal consequence die every day — great artists who have enriched our lives with lasting contributions to the culture do not. 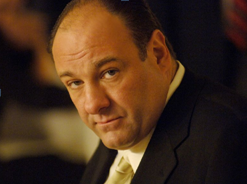 When James Gandolfini passed, so did a great artist, and that is a loss to be mourned. Taking inspiration from real life Meanwhile, the writers fleshed out Tony by cribbing from Gandolfini — in particular, his temper.